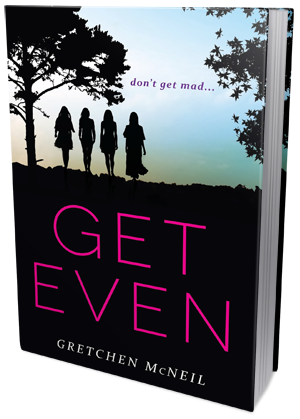 Gretchen McNeil is one of my favorite teen thriller writers. This woman can not only expertly blend teen drama with blood chilling suspense, she can make it all believable and truly convincing. With her latest literary endeavor being a series (as opposed to the three stand-alones she wrote earlier), I was excited but also just a little bit worried that the books would be a bit more "watered down". Get Even was not as dark and substantial as her stand-alone books for sure, but it was still captivating, entertaining and extremely readable. I was actually quite surprised by how well plotted and remarkably cliché-free the story was, and the only thing I had a problem with was the ending. Because, let's face it, the ending just wasn't there. Now, I know, I know, this is the first book in a series, but even then there should be some sort of semi-conclusion and at the very least some of the questions should be answered, but instead, we remain completely blindfolded and just as confused as we felt at the beginning. And the book ends in a way that makes you want to pull your hair out. Still, all things considered, this was a great read and I had way more fun with it than I expected. Bree, Margot, Olivia and Kitty couldn't be more different from one another if they tried. They have zero things in common and belong to different social groups. In public, you will almost never see them together. There is only one thing that links all the girls together, and that is revenge. They're all members of a secret society called Don't Get Mad. DGM is all about getting even and making sure everyone gets what they deserve. Girls stand for social justice, they punish the bullies and the meanies (both students and teachers). They're the judges, the revenge-plotters and the executors, and they've been doing a pretty good job so far. At least until their 'targets' start dropping dead, their signature DGM cards are always planted at the crime scene, and the girls realize that they've become targets themselves, and they can't trust anyone - especially each other. As usual, Gretchen McNeil does not hold back. People are dropping dead one by one, just like in TEN, crime scenes are reasonably bloody (not too gore to cross the line to a cheap-feeling B-class horror story, but bloody enough to chill your guts), the tension holds up nicely and escalates evenly, and you really have no idea what is going on. In other words, this is yet another solid teen thriller/murder mystery that fans of McNeil's previous work will definitely enjoy. Even with it being book one in a series, Get Even packs a strong punch. I'm not going to lie, the ending bothered me. I was so invested in the story, I felt a bit let down not to get any answers whatsoever. I kind of regret picking this book up so early, because really, it's a torture to wait for the rest of them to come out. This is the kind of series that I think should be read all at once, without having to wait a year for he next volume to hit the shelves. I don't know if I'll be able to hold off on reading book #2 until #3 is available (probably not), but I'm pretty sure I do want to re-read the entire series at some point, once it's completed.